For those of you wondering about the zipper insertion and finishing technicalities, here’s some more detail. I began with a crochet steek. There seem to be several different methods floating around on the internet with excellent tutorials, but I did it the simple way Jen taught me. 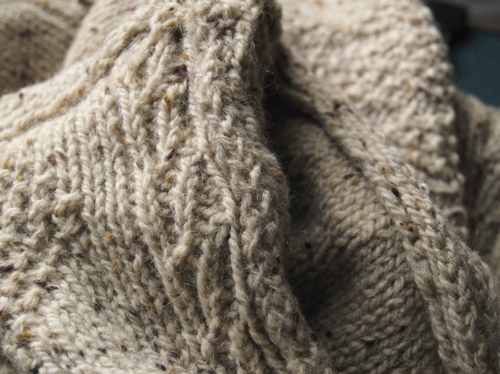 1) Leave an extra allowance of three stitches for the steek when you begin the knitting. Twist the stitches on either side of this column for a neat, crisp edge. 2) Weave a line of bright waste yarn down the center of the stitch you’re going to cut – the middle column of the three. The numbers correspond to each side of the stockinet V’s. The vertical lines down the center are your waste yarn, marking the steek line. This is where you’ll cut. 4) Using a finer weight yarn that matches the main sweater yarn (I used Jamieson Shetland Spindrift in Moorit, which matched the Ballybrae Blainin Tweed beautifully), crochet a single chain line by inserting the hook under 5 & 4, drawing through a loop, inserting the hook under 5 & 4 in the next row down, etc. Then chain together the 2’s & 3’s in the same manner up the other side. For an armhole steek, you’ll work a continuous chain down one side, under the bottom of your steek line, and up the other side. For full cardiganization, you’ll want to let your chain trail off to either side at the tops and bottoms for a few extra stitches to secure your work. Later you can unpick these extra stitches and weave in the resulting end. At any rate, you never want to cut across your crochet chain. 5) Cut along the line between 3 & 4, which you marked with your waste yarn, pulling the waste yarn out as you go along. It’s really easy to see the little horizontal bars to cut if you’ve done your crocheting properly – you’d have to work at it to cut in the wrong place. 6) The cut edges will naturally roll inside, and with some handy steam action from an iron, you can easily persuade them to stay there. You want the crease to leave your neatly twisted edge stitches, well, right on the edge. 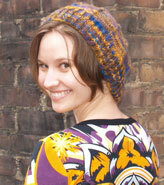 For the armholes, you’ll want to tack down the cut edges on the inside in the same yarn you used for the crochet job. 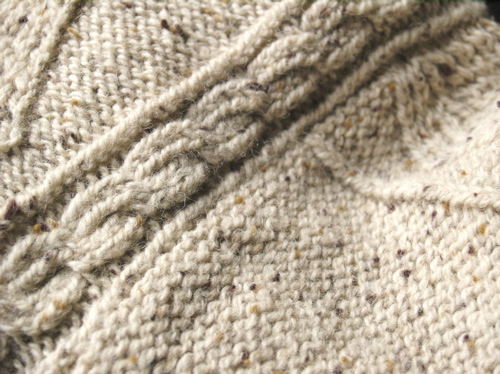 I used a herringbone stitch per EZ’s instructions – very tidy indeed. As you can go along, you can tuck in any raggedy cut strands that might be rearing their heads, and the herringbone stitch will batten them into place, never to worry you again. 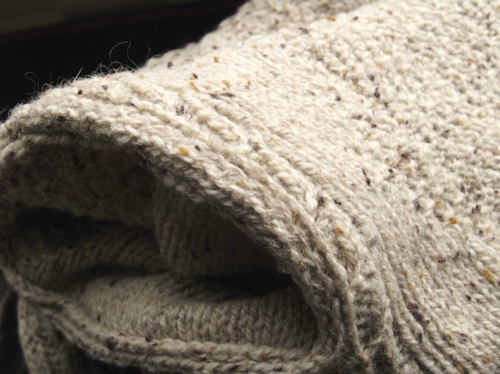 Skim the thread or light yarn through the body stitches so it won’t be visible from the outside of the sweater. Now sew in your sleeves, attaching them to the running bars between the twisted edge stitches and the crocheted edge. I promise, it will be obvious what I mean. This leaves your twisted stitches as a neat divider between sleeve and body. Time to sew in your zipper. For the love of Pete, make sure it’s the right length. 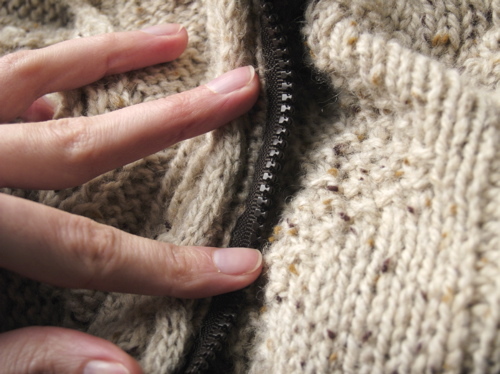 Insert yourself or your subject into the sweater and double-check your zipper length. Begin by pinning the zipper in place. I used these nifty two-prong pins my mother-in-law gave me. I have no idea what they’re actually called, but they worked perfectly. Make sure the steeked edge stays rolled under as you pin. With thread that matches the sweater yarn, whipstitch the 1’s and 6’s to the zipper about half a centimeter from the teeth. 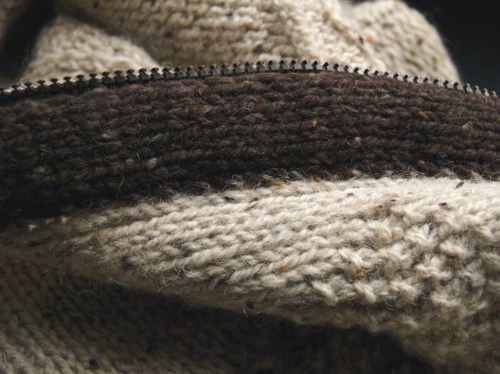 Use small stitches, or the zipper won’t feel firmly attached to the sweater fabric and may not stand up to manly tugging. (I wouldn’t want to test it, would you?) The whole zipper sewing process is easiest if you unzip the portion you’re working on. Once the zipper is in, you can sew in ribbon facings to cover the back of the zipper, or you can do as I did and knit contrasting facings. A six-stitch stockinet strip worked well for me. Again, when sewing it in, skim the needle through the surface of the sweater fabric, but do not penetrate or the stitches will show through. 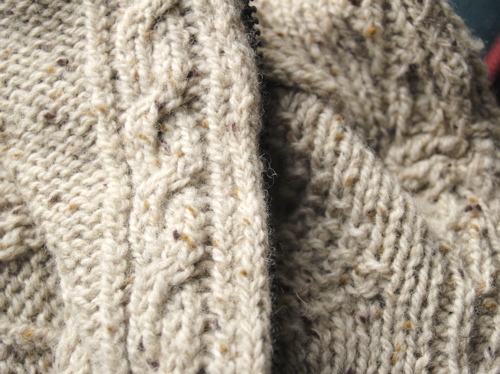 Last of all, work two lengths of i-cord in the sweater yarn – I made a four-stitch cord – to conceal the zipper from the outside. This also has the virtue of covering any ugliness that may have happened in the whipstitching. Pictures. Want pictures? Of course you do. Clockwise from upper left: the sleeve join, right side; inside of armhole steek showing herringbone stitch; different view of armhole steek; zipper, showing slatternly whipstitch attachment; zipper facing on the inside; i-cord concealing zipper from the outside. I know it’s hard to see the herringbone stitch. If this were a proper tutorial, I’d have done it in a bright color so you could see the thread. But I was going for tidy and unobtrusive. I’m intrigued by the sculptural and textural properties of this sweater, especially when it’s all crumpled and inside-out. The Fishtrap pattern is a freaking piece of art. Elizabeth Zimmermann sure knew what she was doing. Purly Whites wrote an excellent post the other day about the virtues and villainies of knitting two socks at once on two circular needles. I’m at the same point in my first pair attempting this technique, and I heartily agreed with most of her points, so I won’t duplicate her efforts. I’ll just add my own anecdotal evidence to the pool of knit blogger wisdom. Casting on both socks at once was bitterly difficult. The first time I gave up. Granted, it was late and my mental powers were not at peak strength. The second time I managed to get the requisite stitches onto the two needles, with the working yarn remarkably at the same place on each sock. Unfortunately, this was some kind of act of mercy from above, and the higher powers did not choose to reveal exactly what they’d done, so I’m not at all certain I can replicate the process. Worse still, I discovered after my first row I was one stitch off on the first sock – 33 stitches on the front needle and 31 on the back needle. I could have just tinked back and slipped the first stitch to the back needle, but the situation raised a serious problem: the way I’d written my pattern, I needed to rotate each sock by three stitches clockwise after the cuff to align the heel. This is easy at one side of the sock, but the second sock prevents you from getting at the other side to slip stitches. You have to back the second sock off onto the trailing needle ends in order to access the stitches you need to move on the first sock. And then you have to get the second sock back on and in the right position. This requires excellent spatial intelligence or a healthy dose of blind intuitive luck. Through the latter, I succeeded, but it would take several more socks before I could feel confident of understanding the technique. The question is: do I want to knit several more socks using this approach? After the first five or six rows, my answer would have been a resounding NO. It’s tricky enough to keep one sock from twisting, or from knitting with the tail by accident, etc. With two, it’s almost absurdly awkward. About ten rows in, I had enough fabric to tell what was what a little more easily, and several inches in, I finally wised up and clipped my tails shorter to eliminate some of the tangling. I use my cast-on tails to mark the beginning of my rounds rather than stitch markers, so I don’t like to weave them in right away. But I am willing to guess the cast-on process would be easier with a little experience under one’s belt. A second pair of socks might offer smoother sailing at this point. I was lucky with these socks: I never had to tink back (which would require tinking back both socks, not just the one with the mistake, unless you backed the unaffected sock off the needles entirely), and I never made the error of failing to switch balls of yarn moving from one sock to the other (which would knit the two socks together). I also had no problem turning both heels at once. And now that my socks have heels and half a foot each, I realize I will have worked the pair from start to finish in about three weeks, which is certainly a record for me. But are they really faster this way, or have I just given them more time than usual? After all, they’ve been on cross-country airplane trips with plentiful delays. But then I’ve been knitting a lot on my father’s sweater and other Christmas projects, and because the socks are less portable than one sock at a time would be, I haven’t done as much subway knitting with them. I’m going to hypothesize that two at once really is slightly faster, if only because you remove the mental block of second sock syndrome. As my poor mateless Retro Rib sock can attest, this is significant. To be fair to the technique, I guess I’ll have to try it at least once more before I decide for or against it. But I have several single socks calling for mates, so for now I’ll continue to espouse the one-sock-on-two-circs method. All photos by my handsome husband, who deserves special thanks for working in such miserable weather without even a long-sleeved shirt. Lightning, from the Rowan Plaid collection by Kim Hargreaves. I used 7 and a half balls of Rowan Plaid in the color “lavender mist” and knit the smaller of the two sizes. When I cast on for this sweater last winter, it was going to be my second adult sweater: I was so enchanted by the pretty scalloped edging that I disregarded the “most difficult” pattern rating completely. Lightning kept me on my toes, and there was much frogging, but she taught me a great deal. I learned about slanting increases and decreases and the way they shape a design. I learned double decreases, three-needle bind off, and how to read a chart. Most importantly, I learned to read my knitting rather than the chart. And so I can heartily recommend this to new knitters: don’t be afraid to tackle something that looks too difficult. Bring your patience, embrace the Frog, and don’t hesitate to ask for help, but if you keep your wits about you you’ll learn more than you ever could with safe, easy projects. It’s been a year now since I finished that first scarf, and all the real progress I’ve made has come when I’ve set my sights on patterns like this one. End sermon. I probably didn’t need to lengthen the sleeves, but it’s nice to be able to tuck your fingers up inside if you aren’t wearing gloves. The only other modification I made was to stitch the fold in the shawl collar in place at the front edges to counteract a bit of floppiness and encourage the proper shape. 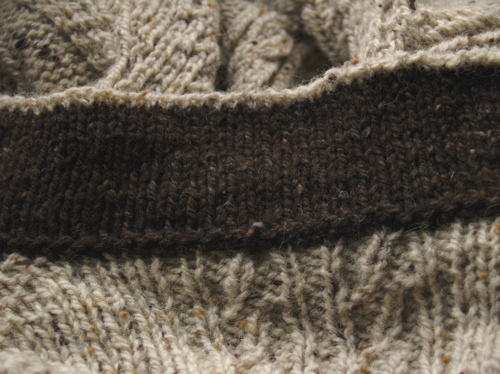 I attached the collar by picking up stitches along the neckline and along the cast-on edge of the collar and then using a three-needle bind off. It looks a little tidier from the inside, which is likely to be exposed because the sweater has no closure system apart from the belt. I’m thinking of adding a single hook-and-eye at the base of the collar, as it does gap open a bit. But all in all, I deem this project a success, and I’m glad to have her finished at last! Yes, friends, that is a genuine tubular cast-on. And it isn’t as tricky as you might think. It works roughly like this: Grab a set of needles 2 or 3 sizes smaller than you’ll need to get gauge for the project. (I’ll be knitting the gansey on US#6s, so I used 4s.) Cast on half the number of stitches you need in a smooth waste yarn. Purl one row, and then knit an elongated row (wrapping twice around the needle – pick up only the first loop on the next row). Then purl a row with the regular yarn and work three more rows in stockinette. Now the fun begins: use a skinny little needle (I used a little #1 circ) to pick up the bumps of main yarn you can see between the elongated waste-yarn stitches. Now you have the full number of stitches, but on two different needles. For a 2 x 2 rib, using the free larger needle (#4), purl two stitches from the large needle, then knit two stitches from the skinny needle. Then purl two more from the large needle, knit two more from the small needle, etc. Continue across the row, and on the next row, switch to the needles you’ll use for the body of the project (#6). Now you can snip out the waste yarn. Voila! A smooth, tubular edge! It’s fun, I tell you. Takes a lot longer than a regular cast-on, but it makes the niftiest little rolled edge. Try it today – clothing is optional!